Since 2009, Earthwatch and EY have collaborated to implement the EY-Earthwatch Ambassadors Program—a global mobility engagement program in which high-performing early-career professionals are selected to participate in one-week expeditions in Brazil and Mexico (prior expeditions also took place in Costa Rica). 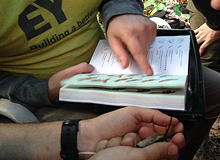 Ambassadors employ their unique skillsets to support local conservation efforts by consulting with local businesses and participating in dynamic environmental field research. Ambassador selection is based on applicants’ work performance and commitment to community engagement. 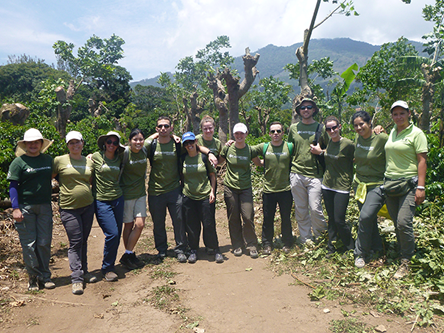 The EY-Earthwatch Ambassadors Program launched in 2009 in Costa Rica, with a pilot team of 11 EY employees. 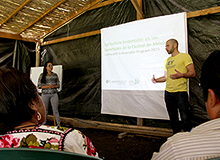 The team spent the first part of the program receiving hands-on training in field research and farming practices. They also applied their business skills to support a local coffee cooperative called Coope Tarrazu. The program proved to be extremely successful and has grown in size and scope since then – expanding to 40 ambassadors per year in two different countries. Since 2009, more than 200 EY employees from across North and South America have participated in the EY-Earthwatch Ambassadors Program. Through one-week field experiences, EY- Earthwatch Ambassadors volunteer their professional skills to benefit local community businesses through a skills-based project, offering their skills in business, marketing, project management, and other areas to businesses that need help growing their markets or expanding their reach. They spend the other half of their time contributing to scientific research projects on some of the world’s most pressing environmental challenges by collecting data alongside scientists. In addition, an alumnus from the previous year joins the new team of ambassadors to give guidance on their project. For example, in 2015 EY-Earthwatch Ambassadors in Brazil supported a local eco-tourism hotel called the Pousada Rio da Prata, which also happened to be where the participants stayed during their expedition. The Pousada Rio da Prata is a family-owned small business that was looking to expand its client base and increase repeat customers. The EY team helped the owners develop new marketing and communications strategies and products. They also advised the Pousada on how to keep better financial control and planning. Earthwatch’s collaboration with EY enables EY employees to broaden their global networks and mindsets, to strengthen their teaming and leadership skills, and to support their professional and personal growth. For example, 2015 EY-Earthwatch Ambassador Maria Kleiber felt the experience on her expedition in Mexico gave her a whole new sense of appreciation and motivation. “The expedition transformed my personal and professional views, and accelerated my growth more than I imagined. Through teaming with professionals from different backgrounds and geographies in Mexico, I was able to see how each team member brought valuable contributions.” Having returned home, Maria shared that this experience helped her with a client project that required bringing together technical and business professionals from around the world. Maria has also continued to be a part of the program as an alumni group leader for the next year’s team of Ambassadors. Participants return to their home offices with a renewed sense of commitment to community engagement and to the environment. As an example, after participating in his expedition, Paden Stephens, another 2015 EY-Earthwatch Ambassador, became the community engagement leader within his local office. He has since spearheaded many volunteer activities and begun to engage with a client’s corporate responsibility team to collaborate on projects. Many participants integrate their experiences into their daily lives by volunteering with local community groups, training colleagues on sustainable business practices or becoming involved with the organization’s Climate Change and Sustainability Services (CCaSS) work. From 2012 to 2015, EY sent three teams every year to countries in Latin America. In 2015, two teams went to Serra do Itajaí National Park in Brazil to support the strategic planning of a local eco-friendly hotel and an environmental consultancy company. They also gathered data on several bird species. The third expedition went to Xochimilco, Mexico to support local farmers in assessing the viability of sustainable farming methods and to collect water quality data throughout the wetlands. Read more about these EY-Earthwatch Ambassadors Program expeditions in Accounting Today or hear directly from one of our Ambassadors in her Earthwatch Unlocked blog post. Additionally, in 2012, EY supported Earthwatch in the creation of the Earthwatch Urban Forest Program in cities such as Boston, San Francisco, Chicago and Atlanta. The one-day program was part of the firm’s annual day of community service, EY Connect Day, and was designed to ignite awareness among EY employees of the sustainability of urban forests. Volunteers produced meaningful scientific data that is used by local authorities and researchers to improve green space in local cities. From 2013 – 2015 more than 100 EY employees joined Earthwatch’s Urban Forest Program in Boston to measure and identify trees, learning about the important role of the urban forest in the city. Since 2009, the EY-Earthwatch Ambassadors Program has donated over 13,000 hours assisting small businesses and conducting environmental research in Latin America. The research project in Brazil that EY Ambassadors have contributed to since 2013 is providing directions to governments (Federal, State and municipalities) as well as conservation and land management professionals on where and how implementation of local scale conservation programs should be undertaken to ensure it is feasible. In Mexico, Ambassadors worked with two sets of farmer groups to help them grow their businesses and work better together as a cohesive group. Farmers are using some of the tools and skills they learned from former EY Ambassadors to improve their businesses. For example, some farmers are using an inventory log that was created by EY to keep better track of their crops. Last year’s skills-based project prompted enhanced leadership ability amongst the group of farmers; one of the farmers is currently part of a group representing regional farmers at a national level, advocating to improve the local farmers’ opportunities and participation in agro-environmental policies. Some of the key learnings during the program allowed him to launch a new brand for his product with members of his family. He’s also since applied for government funds to help foster smallholder farmers' startup initiatives. Some members of the group are also forming small working groups and participating in local and regional farmers markets and fairs. In Costa Rica, volunteers worked with a 2,600 member coffee farming cooperative. Ambassadors collected data alongside scientists to help understand the practices that lead to more sustainable coffee production. The Ambassadors also assisted the cooperative with defining effective strategies for communicating with their key stakeholders, including cooperative members, employees, local and international customers and the local community.